Our hardened hookbaits are great to use in all circumstances, especially when fishing over the same bait freebies. They will stay on the hair for long periods of time giving you, the angler, complete confidence. To make our hardened hookbaits we use a combination of the finest quality egg albumin and a long drying process. Our hardened hookbaits are great to use in all circumstances, especially when fishing over the same bait freebies. They will stay on the hair for long periods of time giving you, the angler, complete confidence. The traditional carp boilie has to be slightly skinned and not rock hard. The baits we make at Urban have a fairly soft texture to them. We like to keep them this way as it helps the fish to digest them and take on water which makes them highly attractive. When fishing hard lakes and rivers, it’s important to leave baits out for long periods of time. This helps to settle a swim, giving confidence to fish in the area. When leaving a bait in the water for long periods, it will become soft and likely to come off when being sucked in by fish. For this reason, we have brought out a selection of hardened hookbaits to give you, the angler, full confidence that your bait is on at all times. The hookbaits are made from the actual base mix but with added milk proteins and hardener. For fishing on the bottom we recommend that you use a hardened hookbait. To add some bouyancy, just tip it with a sliver of one of our pop ups. Our hardened hookbaits come in either the conventional round shape or in a barrel shaped option. This gives you two great types to test out. 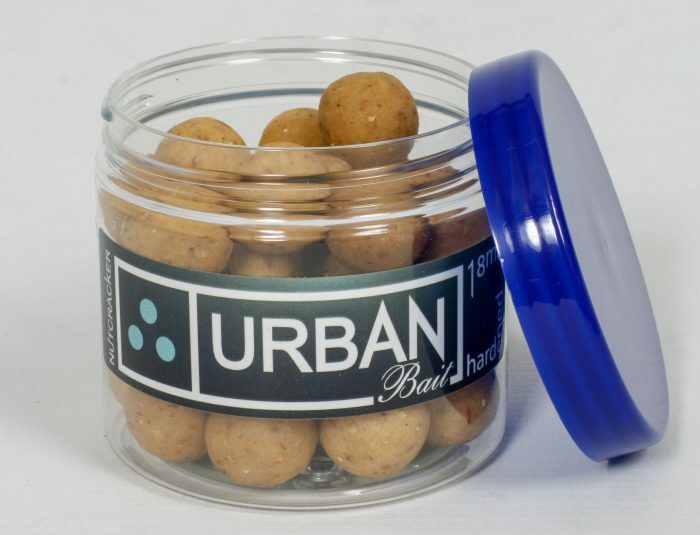 In the following video, Nigel Sharp walks you through the reasons why the Urban Bait range of hardened hookbaits can be such a powerful tool. Great for getting round lakes with crayfish and if you’re planning on leaving your rig out for a long time. Puts more confidence in my rig and knowing the bait will still look the same when out there for a long period of time. Great product, does exactly what is says on the tin! Hardened in texture but still washes out naturally like the matching freebies! Get on it! !